14 • RV PRO • September 2018 rv-pro.com R V M A N U F A C T U R E R S vice president of product development and marketing. The Omni and Magnitude will weigh in at around 19,000 pounds. The fact that the Omni and Magnitude are TMC's only new brands for Open House illustrates TMC's view of the current market. "We have spent the last five years looking at the overall market and focusing that product on what consumers say they need in the market. We feel pretty confident in what we're doing," Krider says. "Now, we're dialing in the 'touch and feel' aspects of the product, along with the features people are requesting. "So we're spending more product development on those items. We think our product lineup is very strong and didn't see many holes that needed addressed; we just want to 'massage' what we already offer." That "massaging" includes a new 27-foot floorplan for its Class C lineup that features a queen-size bed (down from a king, because consumers are saying a queen is large enough for their needs) but a larger bathroom; a Class A Outlaw toy hauler with a unique garage layout; and a clever way to feature a sofa and dinette in the front of its Sprinter-based brands and still provide a walk-around bed in the rear, Krider notes. 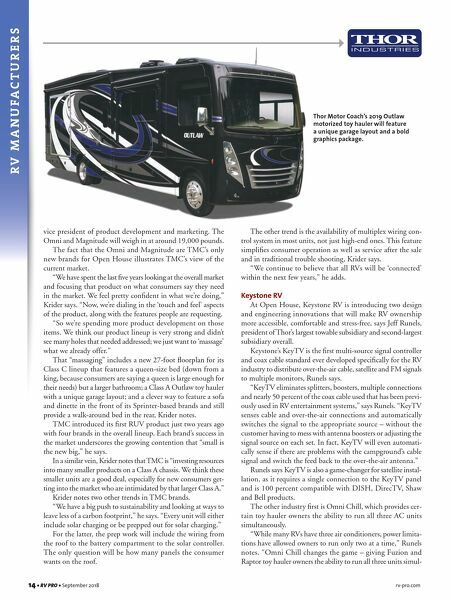 TMC introduced its first RUV product just two years ago with four brands in the overall lineup. Each brand's success in the market underscores the growing contention that "small is the new big," he says. In a similar vein, Krider notes that TMC is "investing resources into many smaller products on a Class A chassis. We think these smaller units are a good deal, especially for new consumers get- ting into the market who are intimidated by that larger Class A." Krider notes two other trends in TMC brands. "We have a big push to sustainability and looking at ways to leave less of a carbon footprint," he says. "Every unit will either include solar charging or be prepped out for solar charging." For the latter, the prep work will include the wiring from the roof to the battery compartment to the solar controller. The only question will be how many panels the consumer wants on the roof. The other trend is the availability of multiplex wiring con- trol system in most units, not just high-end ones. This feature simplifies consumer operation as well as service after the sale and in traditional trouble shooting, Krider says. "We continue to believe that all RVs will be 'connected' within the next few years," he adds. Keystone RV At Open House, Keystone RV is introducing two design and engineering innovations that will make RV ownership more accessible, comfortable and stress-free, says Jeff Runels, president of Thor's largest towable subsidiary and second-largest subsidiary overall. Keystone's KeyTV is the first multi-source signal controller and coax cable standard ever developed specifically for the RV industry to distribute over-the-air cable, satellite and FM signals to multiple monitors, Runels says. "KeyTV eliminates splitters, boosters, multiple connections and nearly 50 percent of the coax cable used that has been previ- ously used in RV entertainment systems," says Runels. "KeyTV senses cable and over-the-air connections and automatically switches the signal to the appropriate source – without the customer having to mess with antenna boosters or adjusting the signal source on each set. In fact, KeyTV will even automati- cally sense if there are problems with the campground's cable signal and switch the feed back to the over-the-air antenna." Runels says KeyTV is also a game-changer for satellite instal- lation, as it requires a single connection to the KeyTV panel and is 100 percent compatible with DISH, DirecTV, Shaw and Bell products. The other industry first is Omni Chill, which provides cer- tain toy hauler owners the ability to run all three AC units simultaneously. "While many RVs have three air conditioners, power limita- tions have allowed owners to run only two at a time," Runels notes. "Omni Chill changes the game – giving Fuzion and Raptor toy hauler owners the ability to run all three units simul- Thor Motor Coach's 2019 Outlaw motorized toy hauler will feature a unique garage layout and a bold graphics package.